Others things have changed. The house prices that soared ever upwards during the boom years have come now down, down, down. In Lakeland counties and villages along Ireland’s longest river—the Shannon—numerous properties are on the market for under $150,000. Depending how far you are from a town or village with amenities, the starting figure for cottages with a small piece of land is now down at around the $45,000 level. 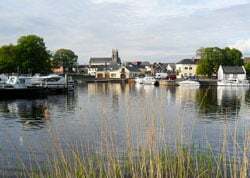 In the boating town of Ballinamore in county Leitrim, a 484-square-foot apartment overlooking the Shannon-Erne waterway and Ballinamore marina could be yours for a mere $35,960. As it comes with furnishings, it would make an ideal vacation property for a fishing-minded couple. Recently reduced by 20,000 euro ($24,800), a two-storey fully restored period property of 1,023 square feet has an asking price of $147,560. Surrounded by mature trees and shrubbery, the property is at Adoon, a 10-minute drive from the Shannon-Erne waterway and Ballinamore. Not that you have to buy. For example, $434 is the monthly rent of a pretty two-bedroom furnished cottage with a garden just outside Ballinamore. Rural Ireland has many places to test drive small town life, but if you want fishing lakes combined with a drama festival, a readers/writers group, traditional pubs and a musical society where new members are always welcome, Ballinamore is a grand location. During winter, the town’s library hosts a weekly comhra (conversation in Irish) group, catering for beginners and rusty Irish speakers. It’s a great way to learn the Gaelic language and I suspect things get even more enjoyable when the group moves into its summer meeting place—McGirl’s pub. Making Ireland even more temptingly affordable for buyers with dollars, the euro has slipped again in recent months. Three years ago, a 100,000 euro property would have cost $145,000. At today’s exchange rate, that’s reduced to $124,000. Lough Allen, Lough Ree and Lough Derg are the main loughs (lakes) that dangle like diamonds from the Shannon’s necklace. 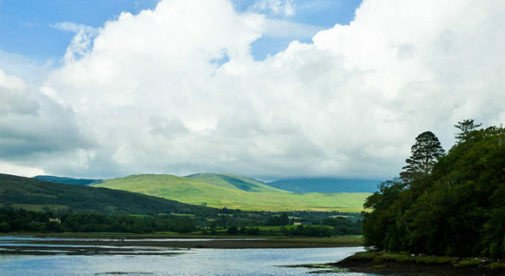 Dozens of smaller loughs also embroider the countryside’s green backcloth with silver-blue. But most visitors only discover these locations by accident. Lakeland counties like Roscommon, Leitrim, and Offaly don’t attract the same visitor attention as Cork and Kerry. Why, I don’t know. But if you seek an “Ireland of the Welcomes” that’s free of Blarney stones, over-priced woolen mills, and pseudo-medieval banquets, this is it. Smudged by little towns and villages, the Lakelands’ countryside offers far more than 40 shades of green. In spring, carpets of bluebells appear in the woods, hillsides are white with May blossom, and riverbanks froth with angelica and celandines. Fall brings a free harvest of hazelnuts, blackberries, elderflowers (for home-made wine), and wild mushrooms. This part of Ireland has been my home since 1989. My own cottage in county Roscommon looks down on Lough Key and its scattering of islands where scholarly monks penned their Annals over a thousand years ago. One of my favorite walks is beside the Boyle River, a tributary of the Shannon flowing into Lough Key. It’s a rare day when I don’t see swans, the turquoise flash of kingfishers, or a gray heron flapping across the reed-beds. Life is tranquil, but things weren’t always so. Now mainly used by pleasure craft, the river Shannon was once one of the country’s main trading routes. Studded with castles, abbeys, and crumbling tower-houses, its villages are scrapbooked with stories of early Christian monks and Viking raiders. For romantics with a passion for history, there’s always something to fire the imagination: holy wells, prehistoric tombs, and ring forts—the fairy forts of legend. Four years ago, archaeologists working near Lough Key discovered a “deviant burial” site going back 1,300 years. Two of the skeletons unearthed had large rocks wedged in their mouths. It’s believed some corpses were buried this way to prevent their rising from the grave to haunt the living. I adore such tales, but even writers can’t live on myth and home-made blackberry jam alone. The practicalities of Irish living include a cool and rainy climate—and that won’t suit everyone. And while property prices have tumbled, day-to-day living costs are high compared to many other European countries. Carrick-on-Shannon is an attractive marina settlement with riverside walks and a five-arched stone bridge. During winter, my monthly electric bill sometimes goes over $250, and I usually spend around $130 a week on groceries and household necessities. Petrol (gas) is currently about $1.67 per liter ($6.68 per US gallon)…and life without a car would be difficult. That said, I have no plans to move elsewhere. I mostly shop in Carrick-on-Shannon, county Leitrim’s principal town. It’s another attractive marina settlement with riverside walks and a five-arched stone bridge on the border with county Roscommon. Even though its population only numbers around 4,500, it has everything I need—entertainment included. The Docks—Carrick’s restored former Courthouse—is a venue for art, music, theater, and even poetry readings. The traditional music “sessions” in Cryans have been a weekend feature for as long as I’ve lived here. On the edge of town, there’s a 10-pin bowling center, a multiplex cinema, and a sports center with indoor pool. Supermarkets include a late-night Tesco (a major UK supermarket), and the German-owned Lidl and Aldi discounters that both stock Continental delicatessen products. You probably wouldn’t impress a sommelier, but bottles of red and white wine in Aldi start at just under $5. On Thursdays, the Market Yard hosts a farmers’ market with an array of organic prode. With its program of classical, jazz, and traditional music, the highlight of Carrick’s festival year is July’s Water Music Festival. There are lots of smaller festivals, too, both in towns and villages. Carrick’s parkland course on the banks of the Shannon is only a five-minute drive out of town—midweek green fees are currently $24.80. There’s no excuse to be bored here. Dublin and Belfast are both approximately a two-hour drive from Carrick, and I can be in Yeats country (county Sligo) and the unspoiled beaches of the Atlantic coast within an hour. Clonmacnoise and Lough Ree are around the same one-hour driving distance. Although it’s doubtful that $10,000 cottages will resurface again (that’s what I paid for mine in 1989), property prices in this locality really have tumbled in recent years. Not far from where I live in county Roscommon, a two-bedroom cottage of around 1,000 square feet on a quiet country lane near Ballyfarnon village has an asking price of $43,400. On a large tree-lined plot, it’s in need of some slight repair, but it’s certainly not a wreck—and oil-fired central heating has already been fitted. In neighboring Keadue (twice winner of Ireland’s tidy towns award and venue of an annual harp festival), a four-bedroom/two-bathroom cottage with a rear garden is $60,760. If you prefer living in a waterfront town with everything on the doorstep, two-bedroom apartments of around 750 square feet in Carrick-on-Shannon start from $61,380. Rentals for furnished apartments of similar size go from $496 monthly. County Offaly’s principal town is Birr, a heritage town with elegant Georgian architecture, tree-lined avenues, traditional shopfronts and an extensive cultural calendar. Although not on the Shannon itself, it’s on one of tributaries, the River Camcor. With a view onto the river, a two-bedroom/two-bathroom apartment of 850 square feet is $93,000. Within the town, terraced townhouses with rear gardens and around 900 square feet of living space start at around $80,600. Although rental prices tend to be a little higher than in counties Leitrim and Roscommon, furnished cottages and houses in and around Birr can be had for $620 to $744 monthly. Also in county Offaly, Banagher does sit on the bank of the Shannon and has a marina where visitors can hire pleasure cruisers. River buses are another watery option to get to Clonmacnoise with its ancient monastery and round stone towers. The town provided inspiration for the author Anthony Trollope who wrote his first novels here. On a half-acre site overlooking the Shannon, a four-bedroom bungalow-style cottage has been reduced by just over $63,000 to $122,760.